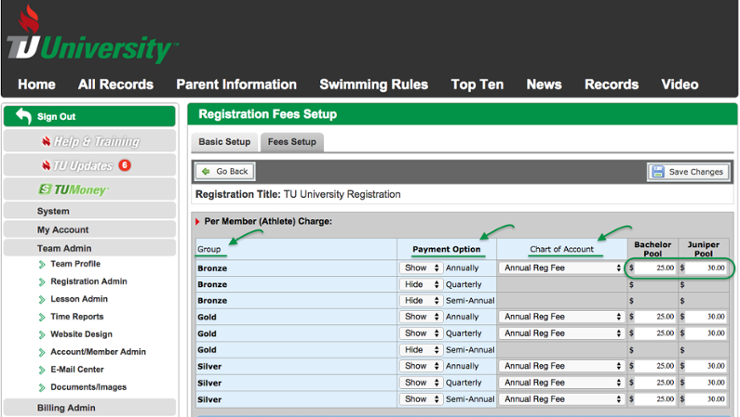 Now it’s time to set up all your payment options and fees you want to collect on the Fees Setup pages. The first page determines all your groups, payment methods, and options. The second determines all the actual fees to collect. It is also a good time to think about how you want to capture payments. Information is not the only great thing we can capture with Online Registration; power comes from the ability to capture registration payments, location fees, yearly payments and much more at time of registration. Click the name (not the checkbox) of your Registration. Click on the Fees Setup tab. Members Must Select [Location] to Register — Most teams only have one location and will leave this as NO. Even if you have more than one location but the prices are the same or the members can freely float among the different locations then leave this as NO. 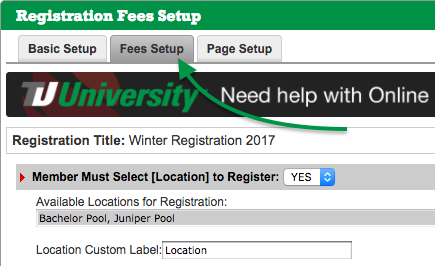 When set to YES you can define different pricing, on Fees Setup page 2, for each registration group depending on the location. Location Custom Label — The default is Location. Only change this if it means something else, such as Resident Status. Available Locations for Registration — Click Select to define and select your different “Locations.” These would be your actual location names, or, as in the above example, “Resident” and “Non-Resident.” When in the Locations area, use Add New and Delete to add and remove locations. Once all of your locations are set, check their boxes and click the Select button. Setup Payment Options for Groups — Use this to allow your accounts to select different payment options for each registration group, such as annual and monthly, that match your billing options. When you set this to YES you can then click Select under “Available Payment Options” to define and select your payment options. The actual dollar amounts are defined on the second page of Fee Setups. When in the Payment Options area, use Add New and Delete to add and remove Payment Options. Once all of your Payment Options are set, mark their boxes and click the Select button. Registration Groups for Member to Select — Click Select to define and select these. Examples of groups include 6 & Under, 7-8, Gold, Silver, Masters, or simply Swim Team. Although they will typically mirror your roster groups, you may want to simplify them if the pricing is the same and the admin is the one who decides which roster group to assign athletes to. When in the Registration Groups area, use Add New and Delete to add and remove Registration Groups. 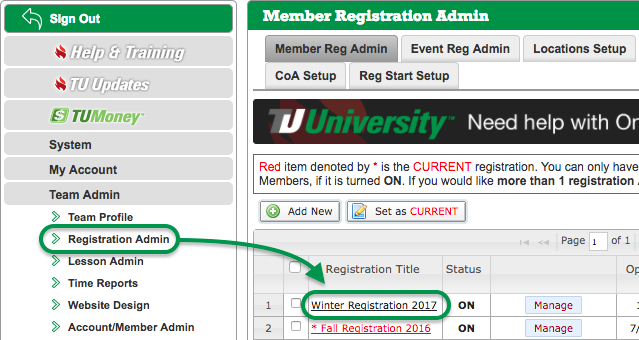 Once all of your Registration Groups are set, check their boxes and click the Select button. When you Add New it is a best practice to fill in all information including Registration Group Name, Age Group (specify range), and a brief Description. Accepted Payment Method(s) — You can select Checks Accepted only, Credit Cards Accepted only, Custom Payment Option only or any combination. If an account pays by Credit Card the payment will be charged immediately at checkout. Admins must approve Checks and Custom Payments in the Manage area of Online Registration. 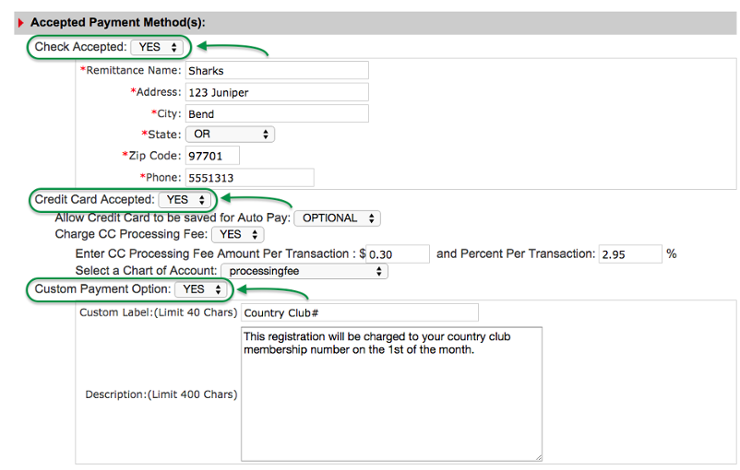 Custom Payments are useful for things like country clubs where fees are charged to the user’s club membership account. Use this in conjunction with the account custom label to capture their membership number. Allow Credit Card to be saved for Auto Pay — For users who pay for their registration with a credit card (CC). NO — CC is only used to pay for their registration. OPTIONAL — Gives them the option to retain their CC info for auto pay which automatically charges for recurring and non-recurring fees each month (or whatever months you define). REQUIRED — Saves their CC info for use with auto pay. Useful for teams who only accept credit cards. If you give accounts the ability to pay by credit card there are major benefits to your team including the ability to save credit cards for Auto Pay. The payments are electronically processed and will be in your bank account in 24-48 hours. If you interested in offering credit card processing please email info@teamunify.com. If you prefer the other two systems, or want to offer all three, that is great, but the payments will need to be gathered and recorded in the Manage section of Registration Admin explained in Step 7. Connect Account Outstanding Balance from Billing System — Select YES to include any outstanding balance owed from the billing system at registration checkout. When you select YES the option below will appear. Allow Credit Balance to Apply at Checkout? — Select YES to allow credit balances to be applied from the billing system at registration checkout. Select NO if you would like to only include outstanding balances. Select Next >> to move to the final fee setup screen and to save changes to current. Do not return to this page without saving, all information will revert back to blank fields. Save first, then navigate back here to make further changes. The second page of the Fees Setup area sets up the actual costs associated with online registration. As you go through this fee setup it is a good idea to check your Roster Groups, Payment Options, Chart of Accounts and Location costs for accuracy. On this page, you will set up Registration Costs, Additional Membership fees, Family fees, Multi-athlete discounts and more. Per Member (Athlete) Charge — This is the calculated fee added to each member at checkout based on their selection during the registration process. The costs you define in each field are associated with the Registration Groups, Payment Options and Locations defined on the previous Fees Setup page. Ensure you select a Chart of Accounts and enter in a dollar amount for each Registration Group (this can be zero). If you do not offer certain Payment Options for certain Registration Groups use the “Show/Hide” toggle, this allows you to turn off and on payment options. Show — turns the payment option on, Hide — turns the payment option off. Other Per Member (Athlete) Charges — This is an additional charge applied to each member (athlete) at checkout and can be applied to specific Registration Groups. One common use is for the USA Registration fees. Add More Per Member Charge — Click to add a charge. This charge needs to be named, requirements defined, Registration Group(s) selected, attached to a Chart of Accounts and an amount defined to work properly. Click OK to add the charge. Once added, you cannot edit it; you can only delete it and add it again. Edit — Select an existing charge and click Edit to change it. Remove Selected Charge(s) — Removes selected Other Per Member charge(s). Registration Group Size Limit — This only appears if you selected the “Per Registration Group Limit” option on the Basic Setup page. If you would like to set registration group size limits, save your changes and toggle on Per Registration Group Limit on the Basic Setup page. If you want to set a limit, add a numeric value; if you want no limit, leave the field blank. This field is enforced in Online Registration and once a Registration Group reaches that number, Online Registration will no longer allow member/athlete sign-ups. Per Account (Family) Charge — This charge can be a required fee (such as annual registration fee), an optional fee (volunteer opt-out charge) or a quantity amount (banquet tickets) applied at checkout regardless of how many athletes someone registers. Add More Per Family Charge — Click to add a charge. This charge needs to be named, requirements defined, attached to a chart of accounts and an amount defined to work properly. If you would like to add a quantity field (such as “How many team swim suits needed”) you can define that here. Click OK to add the charge. Once added, you cannot edit it; you can only delete it and add it again. Remove Selected Charge(s) — Removes selected Per Account Family charge(s). Yes - Dollar — Applies a flat dollar amount discount to one, many or all member registration groups. It does not add up the discounts; rather it applies the amount corresponding to how many athletes registered. For instance, if you enter a $20 discount for two athletes and $40 for three, then if three athletes register they will get a total discount of $40, NOT $60. If there is a certain registration group that you do not want to discount use the Groups NOT discounted to pick which groups are exempt. Yes - Percentage — Takes a percentage off of the total dollar amount calculated from registration group fees only. It does not add up the discounts; rather it applies the amount corresponding to how many athletes registered. For example, if you have a 10% discount for two athletes and a 20% discount for three athletes, then if three athletes register it will add up the Per Member Athlete Charges for all three and apply a 20% (NOT 30%) discount to that total. If each athlete costs $100 then it would take 20% off of $300. If there is a certain registration group that you do not want to discount use the Groups NOT discounted to pick which groups are exempt. Additional Fee/Question — Toggle to YES to turn this function on. Answer — Select Yes/No as the answer that will implement the fee/discount at checkout. For instance, if you select YES for the question above, then if the user answers Yes they will get the fee/discount applied at checkout. Fee/Discount Name — This will be the line item see at checkout and on the invoice. This charge will show on the checkout page with the dollar amount applied/discounted. Fee to Charge — Enter your fee or discount (discounts are denoted with a minus sign) in this field. Chart of Account — Use the drop down to apply the Chart of Accounts to track your dollars. Your registration is set up, your fees and charges are now defined and you are ready to kick off this registration process. Now that you have completed setting up your Online Registration it is time to Save Changes. Do not use the Go Back button if you have not saved your changes, all that you just set up will be erased. Once you Save Changes it is good practice to test your Online Registration to see what steps Parents/Accounts will walk through. For any additional information or questions on Online Registration visit our Knowledge Base on the Online Registration Process.